It’s safe to say that this is not for everyone; I’ve seen so many mixed reviews of this book that I was quite hesitant to begin reading it. Luckily, I can count myself as one of the people who absolutely adored The Sky Is Everywhere - and even went so far as to re-read it a few days later. 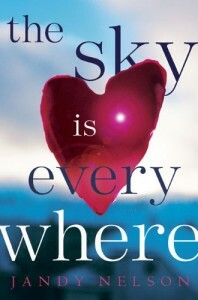 The Sky Is Everywhere provides a thoughtful, emotional, authentic, and revealing portrayal of grief. It shows how grief can drive people together who were never really that close; how relationships can form as a crutch of sorts, allowing those involved to soak up each others grief as if it were their own, to provide comfort and strength, and to help each other feel less lost and to feel whole, if only for a little while. It also emphasizes that there is no “right” way to express grief or cope with loss, as Lennie’s response involving music, writing, and juggling relationships with two boys certainly shows. While this is primarily a book about grief, relationships, both familial and romantic, play a very important role. Lennie’s eccentric grandmother who believes that Lennie’s life force is tied to a plant; her Uncle Big who is known around town as a womanizer; her mother, who had the “restless gene” and left, resulting in an unconventional upbringing; Toby, Bailey’s fiance, who understands her grief more than anyone; Joe, the new boy in town, who shows Lennie that it’s possible to find love after loss – all of these relationships help Lennie to find herself and to come to terms with the loss of her sister. Jandy Nelson’s writing is incredibly beautiful and evocative. Poems and notes that Lennie has written on whatever she can find at the time of inspiration (coffee cups, trees, candy wrappers) are interspersed within the narrative. These are filled with conversations between her sister and herself, memories of the two of them, dreams, and questions, which give us an honest glimpse into the depth of her grief and make her feelings seem even more real. I’m so glad that I had the experience of reading The Sky Is Everywhere, and I know that it will stay with me for a very long time.